Kokuga Sosaku Kyokai was established by a group of young painters in Kyoto:Chikkyo Ono, Bakusen Tsuchida, Kagaku Murakami, Banka Nonagase, Shiho-Sakakibara,and Hako Irie. Kokuten was the shortened name of the society. Kokuga Sosaku Kyokai was founded on the principle that it is imperative that any artist should have complete freedom of expression. As Ryuzaburo Umehara, a friend of Bakusen Tsuchida, and Riichiro Kawashima gained membership in 1925, the society split into two parts. The first was the Japanese Painting Division, and the second was the Western Style Painting Division, which later developed into the current Painting Division.The first exhibition, named Kokuten,was held in the following year. The Kokuga Sosaku Kyokai was dissolved in 1928, while its second division became an independent organization called Kokugakai. However, it continued to use Kokuten asits shortened name. At its founding stage, Kokugakai was influenced by Shigetaro Fukushima. It helped to introduce renowned western painters to Japan by organizing special exhibits every year. The artists shown included:Matisse, Bonnard, Rodin, Bourdelle, Bernard Leach,Rouault, Monet, Renoir, Chagall, Picasso, and Cezanne. These exhibitions not only helped members train themselves, but also contributed to influencing other artists in Japan, who until then had very little chance to see Western paintings. In addition to the Painting Division, Printing, Sculpture, Craft, and Photography Divisions later came to form an organization consisting of five divisions. 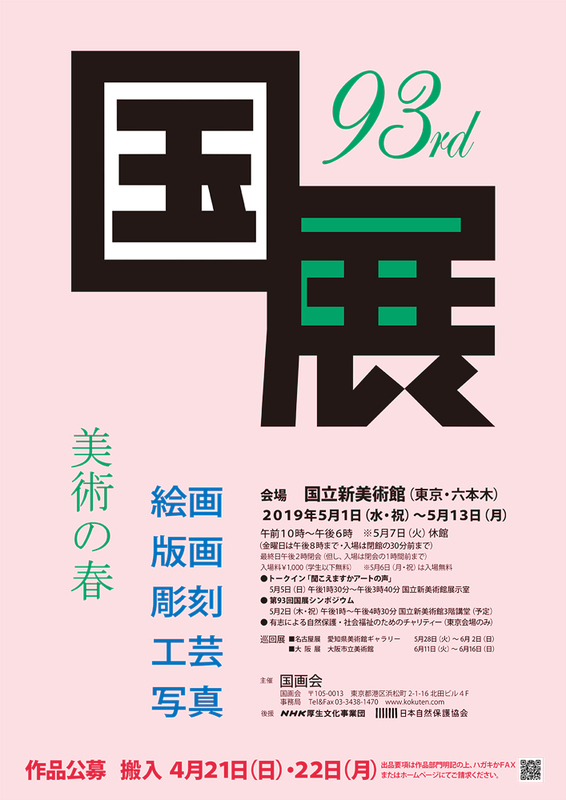 Since 1926, it has been holding Arts in Spring-Kokuten exhibitions every year at the Tokyo Metropolitan Art Museum, except in 1945. The 80th exhibition was held in 2006.And the event moved from Tokyo Metropolitan Art Museum where it had been held since its establishment, to The National Art Center Tokyo in 2007. The motto of Kokugakai is its founding spirit of “free creation”. It is regarded as a general arts organization that values individual styles, and is widely supported as a society capable of responding to diverse methods of expression and to the needs of the younger generations. The society is run by a governing. 2006 Panel Discussion : Vicissitudes leading up to the 80th KOKUTEN Exhibition and Possibility of Representation. 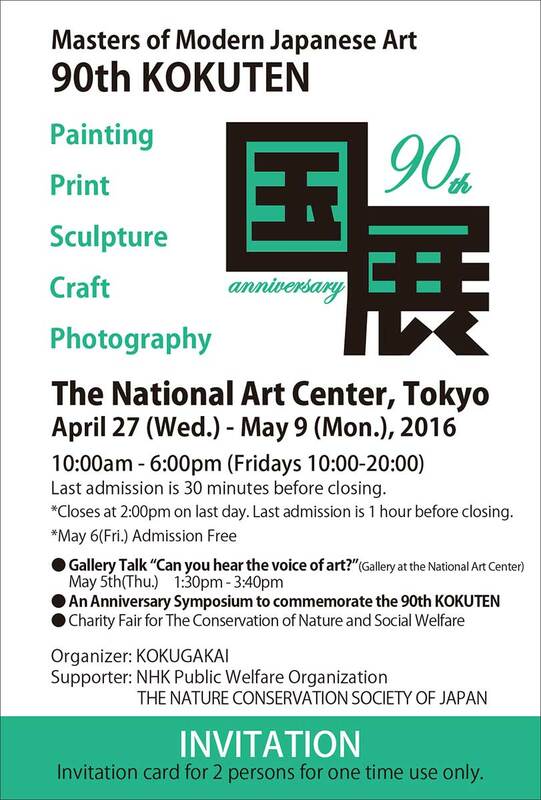 Commemorative publication : A Trail covering 80 years－The History of Kokugakai. 2007 Talk-in:Can you hear The voice of Art?